무더운 여름 혹은 9월 입학을 준비하기 위해 Mini-Sessions의 기회를 제공합니다. 6명 이하 의 어린이들의 개별 성향을 고려해 다양한 체험 위주의 놀이 환경을 제공 합니다. 유아교육 정 교사와 매사추세츠에서 인증받은 데이케어 환경에서 안전과 건강식 친환경 위주의 간식과 점심이 제공 됩니다. 시간 되실때 미리 예약 후 아이와 함께 방문하시기 바랍니다. 저희 어른도 미국에 와서 새로운 환경과 다른 언어로 적응하는데 많은 스트레스를 받고 힘들어합니다. 하믈며 아직 어린 아이들이 엄마와 떨어져 모든 것이 낯설고 영어가 많이 부족한 친구들이 일반 미국 데이케어에 다니면서 영어로 수업을 받고 많이 스트레를 받고 정서적으로도 많이 힘들어 하는 것을 보았습니다. 이 친구들에게 저희 데이케어는 킹더가든에 가기전 최대한 발 적응 준비를 돕기위해 한국어와 영어 이중언어를 동시에 사용하고 아이들의 개별 발달에 따라 다양한 체험 위주의 놀이 환경 즉 창의적 교육을 본 원에서는 제공하고자 합니다. 유아교육 전공 10년이상 가르친 정교사와 5년 이상 미술 전공과 프리스쿨 미국 공립 학교에서 가르친 교사로서 경험이 많으신 미국인 교사와 함께 도보 3분 거리 도서괸에서 스토리 타임을 참석합니다. Let me first introduce my daycare and myself. First, about myself: I’ve studied early childhood development for a long time. I’m from South Korea, and I have undergraduate degrees in early childhood education and English literature and several year experience as a teacher and care provider for various age groups between 6 months and 12 years. I have a specific interest in using art in early childhood education, such as origami. Most important, I have been a mother, and have raised two children for the last 10 years, and I understand the difficulty, opportunities, responsibilities, and joy of raising a child. 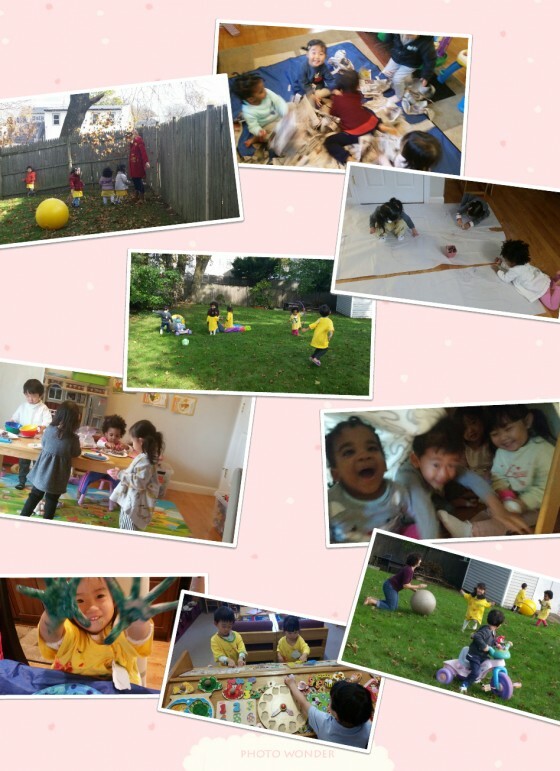 The goal of my daycare is to provide children with opportunities to develop physical, emotional, and cognitive abilities in a comfortable, safe environment similar to a family. I provide an atmosphere of learning and discovery that includes many opportunities to grow up curious and creative. As a licensed Family Child Care Educator, I would like to congratulate you on choosing licensed Family Child Care. You have made an important childcare decision for you and your family. The Department of Early Education and Care (EEC) and I invite you to join in a partnership with us to ensure a high quality child care environment. This parent handbook and enrollment packet outlines many of our policies and procedures that relate to the care of your child, as well as the information I am required to give to you when you enroll your child in my care. This handbook will also acquaint you with some of the key EEC standards designed to ensure a safe, healthy and educational childcare experience. I encourage you to maintain an open dialogue with me, as communication between parents and Educators is the foundation for a solid working relationship, and a good childcare experience. Before filling out your childcare enrollment form, please read through the information contained in this parent handbook. A bit about myself: I am a long-time student of early childhood development. I have undergraduate degrees in early childhood education and English literature and lengthy experience as a teacher and care provider in both structured and unstructured environments for a variety of age groups between 6 months and 12 years. I have a particular interest in using art in early childhood education, with one specialty being origami. But most importantly, I have the critical experience of being a mother myself, having raised two children for the last 10 years, and I understand the challenges, opportunities, responsibilities, and absolute joy that come with raising a child. The overall goal of my daycare will be to provide each child with age-appropriate opportunities to develop physical, emotional, and cognitive abilities in a comfortable, safe, and family-like environment. I strive to provide an atmosphere of learning and discovery that includes a wide variety of opportunities to grow up creative and curious. To this end, I’ve planned daily, weekly, and monthly curricula with activities and subjects appropriate to different ages and development at stages that includes appropriate meal, play, and rest periods. These curricula generally follow the age-appropriate educational programming of the National Association for the Education of Young Children (NAEYC) as recommended by the State of Massachusetts. Curiosity Childcare’s mission is to provide each child with age-appropriate opportunities to develop physical, emotional, and cognitive abilities in a comfortable, safe, and family-like environment. We strive to provide an atmosphere of learning and discovery that includes a wide variety of opportunities to grow up creative and curious. We use daily, weekly, and monthly curricula with activities and subjects appropriate to different ages and development at stages that includes appropriate meal, play, and rest periods. These curricula generally follow the age-appropriate educational programming of the National Association for the Education of Young Children (NAEYC) as recommended by the State of Massachusetts and may include a variety of components related to language, social studies, science, health, math, and art depending on the child’s age. Our curricula also includes opportunities to learn self-help skills that foster independence, gain problem solving and decision making competency, practice leadership skills, and learn about proper nutrition, good health, and personal safety. We strive to provide an environment that promotes cultural, social, and individual diversity. Daily routines are flexible and respond to the needs and interests of children but include meeting the physical needs of children, at least 60 minutes of physical activity every day, child-initiated and teacher-initiated activities, and daily outdoor play whenever weather permits. While we do have schedules for infants, we believe that infants be fed when hungry and put to bed when they are tired. Infants should be talked to and played with on their own schedules. Progress reports are completed periodically for all children in care. For infants and children with identified special needs, I will complete progress reports every three months. Reports are completed every 6 months for toddlers and preschoolers and every year for school age children. I will share your child’s progress reports with you and offer an opportunity to meet and discuss your child’s development. Feel free to ask me about curriculum and progress reports and how they are implemented in my program. Curiosity Childcare provides lunch and AM/PM snacks for children 15 month year older. All meals served meet the nutritional guidelines set by the USDA and include lots of fresh fruit and vegetables; the milk, eggs, and tofu, and thin-skinned fruits and vegetables that we use are exclusively organic, and we use organic meat whenever possible. Meals and snacks are prepared in accordance with the allergy and other special dietary information parents provide on the enrollment forms, but some dietary circumstances may require parents to provide prepared meals and snacks for their child(ren). If preferred, parents may also bring meals and snacks from home for their child. 저희 프로그램은 The National Association for the Education of Young Children(NAEYC)을 기본으로 매사추세주 추천을 통한 프로그램과 매사추세주에서 제공하는 Family childcare 자격증을 소지하고 유아교육과 영어 영문학 전공한 교사가 Department of Early Education and care(EEC)와의 파트너 쉽으로 각 아이의 연령에 맞는 교육 프로그램과 수준 높고 안전한 환경을 적용할 것 입니다. 영유아의 전인적인 발달을 위해 어린이의 건강한 성장을 도우며 전문적인 자질을 갖춘 교사가 부모님과 함께 질적 보육및 교육을 실시 하고자 합니다. 1) 영유아의 성장을 돕고 사회성 및 인성 발달의 기회를 제공합니다. -각 아이의 자율적, 창의성, 다양성을 인정하고 존중합니다. -우유,두부,계란,요플레,샐러드,껍질이 얇은 과일 오거닉 제공. 매월 식단 메뉴가 제공됩니다. 6) 부모 상담을 통해 공감대 형성과 소통을 통해 유아의 발달단계를 알고 상담의 기회를 제공합니다. 7) 유아 교육 전문 지식과 체계적이고 종합적인 교육을 받은 교사가 사랑과 모범으로 가 르칩니다. 매사추세추 주 Family childcare 자격증, 유아 교육 정교사 2급 자격증 소유(한), 유아 교육과 영어 영문 학과 졸업, 유치원, 어린이집 정 교사 경력, 미국 프리스쿨 보조교사, 한글학교 교사, 그룹 프리스쿨 교사, 보스톤 미국 교회 유아반 교사로 경험 많습니다. 특별히 10년이상 남아 여아를 키운 살아 있는 경험과,아동 미술,유아 음율 음악, 아동 발달 및 심리, 교육학 이수, 종이접기 교사 자격증,Institute of child Nutrition The U of Mississippi 증서, 그 밖의 영유아 관련 안전을 위한 First Aid, CPR-AED 자격, 영유아 돌연사 교육 증서, 라이드 안전 교육, 어린이 약물 투약 교육을 받았습니다. 좀더 자세한 부분은 Parent Handbook 을 통해 알려드리고자 합니다. 그 밖의 궁굼하신 부분은 직접 방문하시거나 연락 주시기 바랍니다. 처음 방문 오셨을때 낯갈임이 심해 걱정 많으셨고 여행 자주 다녀오셔서 자주 빠져 적응 하는데 시간은 좀 걸렸던 기억이 나네요. 하지만 요즘 너무나 잘 적응하고 적극적으로 활동 수업에 참여해 너무나 대견하고 사랑스러워요. 약 30분 넘는 고속도로 타고 오시느라 너무 고생 많으신데 아이가 친구들과 잘 놀고 간식도 점심도 너무 잘 스스로 먹어 보람 있으실 것 같아요. 요즘은 친구들과 함께 책 읽기는 시간과 한글 워크북 하는 것을 좋아합니다. 얌전한 모습도 있지만 계속 움직이고 야외 활동 하는 것을 좋아해 밖같 놀이도 너무 즐거워합니다. 앞으로도 계속 즐겁게 원에서 지내기 위해 잘 보살 피겠습니다. 감사합니다. She is a wonderful student and sweet girl. She is able to express her needs and wants verbally. She learned our rules and routines quickly. She enjoys playing with other children. We are very pleased with her progress and enjoy having her in daycare. Our daughter has been attending curiosity daycare since June and the teachers have been amazing and has been a great help with the incredible development of our Little one. She loves the teachers there and constantly talks about them even at home. The communication between teachers is exceptional and we get constant updates through pictures and videos. They provide Fresh and quality meals and snacks too. We definitely would recommend curiosity Daycare to others. Thank you always for caring and your kindness to our child and treating her as if she was your own. 바쁘신데 시간 내주셔서 댓글 달아주시고요. 첫 상담 오셔서 낯갈임이 무척 심해 걱정많이 하셨는데 첫 시간 부터 울지 않고 엄마랑 인사하던 모습이 지금도 기억나네요.. 너무나 여성스럽고 이쁜 모습과 활발하고 퍼즐이랑 자동차도 좋아하고 특히 미술 놀이를 좋아해서 저도 즐거운 마음으로 수업 준비를 해요..
오늘은 한달 동안 배운 노래를 스스로 흥얼거리고 율동을 따라하고 간단한 영어를 알아듣고 따라 하는 걸 보면서 보람과 사랑스러움을 느낍니다. 현재 Mini –Sessions 다니고있는 아이 엄마예요. 낯가림이 있고 말도 느린편이라 걱정을 많이 했는데 선생님의 따뜻한 보살핌 덕분에 적응도 빨리하고 즐겁게 잘 다니고 있어요. 원에서 엄마가 해주지 못하는 다양한 미술놀이도 하고 뒷마당에서 신나게 뛰어놀 수 있는 점도 좋은거 같아요. 그리고 매일 원에서 어떻게 생활하는지 사진도 보내주시고 아이에대해서 말씀을 많이 해주셔서 안심이되고 믿음이 갑니다. 어머니 바쁘신데 소중한 댓글 감사드려요. 캘리포니아로 이사 가셔서 ㅅㄹ이가 적응잘하고 잘 지내는 소식도 듣고 예쁜 모습도 볼수 있어 좋았어요. 작년 이맘때 함께 모종조 심고 잼밌는 활동 한것도 기억나네요. 처음에는 낯 갈임이 심했지만 3일째 부터는 저랑 많이 친해지고 매일 매일 오고싶다고 노래도 잘 따라부르고 선생님 많이 보고 싶다는 말에힘을 얻었던 기억이 나네요. 아이들은 본인을 사랑하는 걸 가장 빨리 느낄수 있다는 걸 다시 깨달았죠. 멀리서 응원해 주시는 만큼 열심히 아이들과 함께 보내기 위해 노력중이예요. 우리 아이가 매주 선생님께 교육받으며, 그리고 써머 캠프 다니면서 정말 즐거워했어요. 낯가림이 심한 아이인데 참 재미나게 다녀서 감사했고, 또 엄마는 믿을수 있는 분께 맡기고 자유시간이 주어져서 즐거운 그런 시간이었습니다. 선생님께서도 두 아이의 엄마로서 엄마들이 무엇을 원하는지, 또 무엇을 걱정하는지 너무나 잘 아시고 아이들의 교육 스케쥴 짜셔서 참 만족했고요 또 아이 먹거리도 아주 중요한 저에게 마음에 쏙 드는 메뉴들 골고루 준비해 주셔서 잘 안먹는 아이가 선생님께 가서는 너무 잘먹고 와서 더더욱 ^ ^ 만족했습니다. 언제나 응원합니다, 우리 아이 잘 교육 시켜 주셔서 참 감사합니다. 아이가 앞으로도 선생님같은 좋은 선생님을 많이 만날수 있으면 좋겠습니다.